China is set to launch a pair of Beidou positioning, navigation and timing satellites from the Xichang Satellite Launch Centre on Sunday, in what will be the country's 33rd orbital mission of 2018. The Beidou-3 satellite pair will be launched by an enhanced Long March 3B launch vehicle using a Yuanzheng-1 upper stage for direct insertion into medium Earth orbits (MEO) at an altitude of around 21,000 kilometres. An airspace closure notice issued on Friday indicates the launch, from Xichang in southwest China, will take place around 18:00 universal time on November 18 (14:00 Eastern; 02:00 local on November 19). The satellites will be the 42nd and 43rd launched as part of the Beidou system—China's answer to the US GPS and Russian GLONASS systems—following the launch of the first in 2000. It will also be the 10th Beidou-related launch of 2018 as China makes a push to complete its system of 35 active Beidou navigation satellites, which takes its name from the Chinese asterism equivalent to the Plough or Big Dipper, by the first half of 2020. The Jiuquan Satellite Launch Centre in northwest China will then be in action late on November 19, around 23:40 UTC, with a Long March 2D launch. 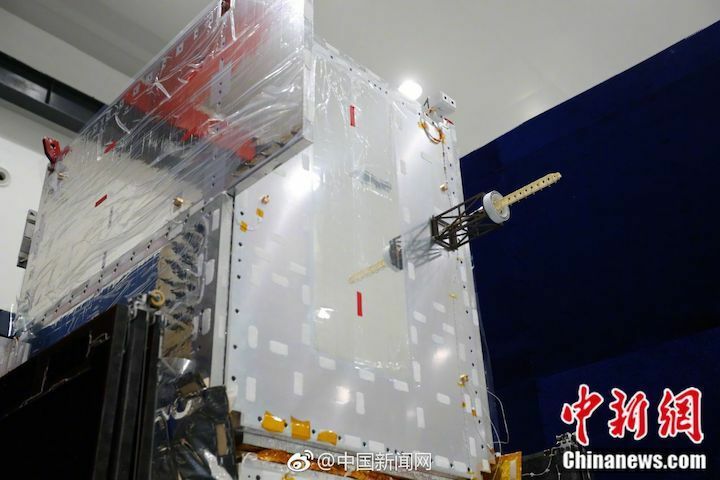 It will possibly carry the SaudiSat-5A and 5B Earth observation satellites into low Earth orbit along with smaller passengers including the Jiading-1 satellite developed by the Shanghai-based private company Space OK. The main contractor for the Chinese space programme, CASC, appears on course to reach its stated target of around 35 launches in 2018—well above the national record of 22 launches set in 2016—with private companies possibly swelling numbers to close to 40 orbital missions. The Beidou-3 satellites are based on a satellite bus that features a phased array antenna for navigation signals and a laser retroreflector with a launch mass of 1,014 kg. The Long March 3B/G2 rocket is capable of lifting 5,500 kg to geosynchronous transfer orbit, and is used to launch heavy communications satellites as well as the Beidou system satellites. The rocket has a core diameter of 3.35 metres and length of 55 m, with four strap-on boosters burning unsymmetrical dimethylhydrazine (UDMH) and dinitrogen tetroxide (N2O4) hypergolic propellant. These boosters have landed close to or amid inhabited areas downrange with alarming frequency, though China says it will test parachute booster landingsin 2019 in order to limit the threat of space debris from launches that take place at the Xichang Satellite Launch Centre. The next Long March 3B will used to launch the Chang'e-4 lunar far side lander and rover mission in early December. Sunday's launch will be supported by a Yuanwang space tracking ship. The Yuanwang vessels belong to the China Satellite Launch and Tracking Control General, which is responsible for the telemetry, tracking and command of Chinese space missions. The Beidou navigation system is China's answer to the US Global Positioning System (GPS), Russia's GLONASS and Europe's Galileo global navigation satellite system (GNSS) constellations. Systems like GPS and Beidou provide civilian applications such as navigation for shipping and road traffic, mapping and surveying and are used wide range of sectors. They also assist military forces from space, facilitating targeting, positioning and locating, and the synchronising of operations. The development of Beidou will end previous Chinese military reliance on GPS.